The survey comes as Dr Tanya Byron conducts a separate review of games and their impact on UK children. Dr Byron, who is conducting the review on behalf of the UK government, will publish her findings in March 2008 and recently closed her submissions for evidence. One of her areas of focus will be the ratings systems in the UK - which currently involves a pan-European system and a UK-only rating from the British Board of Film Classification. The games industry has gone to great lengths to stress the educational and social aspects of gaming, while emphasising that games are regulated and appeal to all ages, with mature titles for mature gamers. A spokesperson for Elspa, the Entertainment and Leisure Software Publishers' Association, said videogame playing was "part of a balanced mix of leisure activities for all ages". Elspa added: "We welcome the opportunity to highlight the range of devises such as age content suitability ratings and parental controls that support parents in exercising their responsibilities." 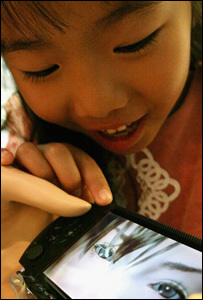 The association said it was committed to educating parents "around sensible and appropriate game play". It has established a website - www.askaboutgames.com - to help parents become better informed about games. The survey was carried out on behalf of Microsoft. Games writer and consultant Margaret Robertson said the findings around ratings were not a surprise. "This is a well-known issue in the UK that while the ratings system is quite good, both parental awareness and understanding of it is quite poor. "The industry has tried a number of initiatives and game specific retailers tend to be fairly responsible about trying to enforce these things." Sixty four percent of children played games alone, less than 1 in 10 children play video games with family members and 12% played with friends, the survey found. "There should be parental concern about some games," said Margaret Robertson. "The survey shows that there is parental curiosity about content and a desire for the ability to have more control and insight into what their children are doing. "There are games that not suitable, games which are sinister, dark and thought-provoking; parents instincts to be concerned are right. "There are games that should be out of the hands of the children. The industry needs to be telling people that and giving them the information they need."